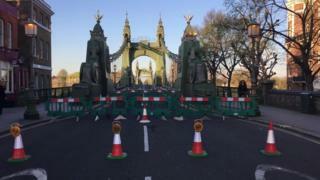 Hammersmith Bridge has been closed to motorists indefinitely after safety checks revealed "critical faults". Hammersmith and Fulham Council said it was left with "no choice" but to shut the bridge until refurbishment costs could be met. Government "budget cuts" left Transport for London (TfL) unable to repair the 132-year-old bridge, the council said. A government spokesperson said: "Between 2015 and 2021 the government is providing £11bn of support to TfL." The spokesperson added: "This funding is helping to deliver key projects like Crossrail, the Thameslink and London Bridge improvements, and our work around airport expansion." TfL said although funding the maintenance of the bridge was not its responsibility, it was working with the council to identify a plan for upgrading the structure. Private vehicles and seven bus services have been banned from using the bridge but pedestrians and cyclists will retain access to the crossing, from Barnes to Hammersmith. The bridge opened in 1887 and requires reinforcing to cope with heavy motorised traffic. The council had previously threatened to close the bridge after its strict rule allowing only one bus to cross at a time was broken. Local resident Laurence said even walking on the bridge felt like "dancing with death". "To say it is critically unsafe at such short notice, especially when we had the boat race over the weekend - where many people were jumping up and down on the bridge - is very concerning," he added. AA president Edmund King said: "We can't afford to have Hammersmith Bridge closed indefinitely. It is an essential artery to keep London moving. "It will cause major congestion and hence more emissions - ironically in the same week that the ultra-low emission zone kicked off." In a statement, the council said: "Our weekly safety checks have revealed critical faults and we have no choice but to shut the bridge. "Hammersmith Bridge is a Grade II-listed, 132-year-old structure. It was never designed for modern traffic. "Closing the bridge is not a decision we've taken lightly and we know it will inconvenience many people. We're sorry for that disruption, but we must put the safety of the public first."